Today's installment of the battle between the Court of Appeals and Judge Scheindlin finds the Second Circuit standing firm on its decision to reassign the stop and frisk cases to another judge because of appearance of Judge Scheindlin's partiality. The Court also says that Judge Scheindlin is not allowed to advocate for herself in the Court of Appeals on this issue. The case is Floyd/Ligon v. City of New York, dated November 13. On October 31, the Second Circuit (Cabranes, Parker and Walker) stayed enforcement of Judge Scheindlin's order intended to rein in the City's stop and frisk practices, which she held violated the Fourth and Fourteenth Amendments. 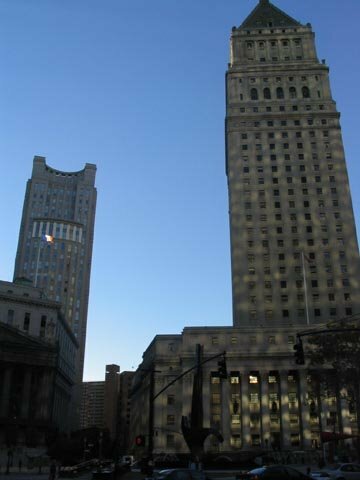 I guess this is the case of the year in the federal courts in New York, as an entire round of litigation has ensued in the Second Circuit even before the parties have argued the case on the merits. The appearance of partiality stems in the first instance from comments made by Judge Scheindlin that a reasonable observer could interpret as intimating her views on the merits of a case that had yet to be filed, and as seeking to have that case filed and to preside over it after it was filed. These comments were made in the earlier case of Daniels v. City of New York, No. 99-cv-1695, in which the City entered into a settlement agreement requiring it, inter alia, to establish policies that prohibited racial profiling. Ten days before Judge Scheindlin’s supervisory authority under the settlement agreement was set to expire, she heard argument on a motion brought by the Daniels plaintiffs to extend the settlement period. The transcript of the hearing indicates that the City had substantially complied with the relief required by the settlement and that the plaintiffs were seeking information from the City beyond that required to be furnished by the settlement agreement. Mr. COSTELLO: We did, we are here. THE COURT: No, you are struggling with the December 31, 2007 deadline in a 1999 case. And if you got proof of inappropriate racial profiling in a good constitutional case, why don’t you bring a lawsuit? You can certainly mark it as related. How could it not be related to this whole long seven or eight years we have lived together in this case? Because you are trying to put a square peg in a round hole. And trying to force yourselves to argue what the settlement means, that it doesn’t mean if you have a timely lawsuit -- you seem to have compiled interesting arguments[.] Ms. Grossman [attorney for the City] has not rebutted -- maybe she did, that’s why we didn’t do something, because we didn’t want them to write this letter, she -- let’s just say she hasn’t substantially responded to your letter. If one had only your letter, it would look like you have a lawsuit. So instead of struggling to telling [sic] me about a stipulation of settlement, why don’t you craft a lawsuit? THE COURT: I knew I had it wrong. The [C]ity violates its own written policy, the City has a policy that violates -- they have violated their policy, here is the proof of it, please give us the remedy. Injunction or damages, or whatever lawyers ask for in compliance. So for $350 you can bring that lawsuit and it is timely. THE COURT: I don’t understand why we have to potentially have, you know, months of briefing when it does fit under this stipulation or it doesn’t, that Raffo applies or it doesn’t that the court has the power to extend the supervision, that we want our immediate appeal to the circuit. Why do you need that if you have a lawsuit? Bring it. They have a written policy, right? MR. GROSSMAN: Yes, your Honor. THE COURT: If you think they are violating their written policy, sue them. THE COURT: . . . There is enough in the public record to craft the suit. And then in that suit simply say, we want produced all that was produced in the 1999 lawsuit. I don't know how you could lose getting it. It may be a question of whether it is still going to be under protective order or not. But I can hardly imagine not getting it. You know what I am saying? It is so obvious to me that any Judge would require them to reproduce it to you in the same format that you have it, that you will have it again. Whether or not it remains confidential. MR. MOORE: To the extent that some of the materials have already been made public. MR. MOORE: you can go to the NYPD website, your Honor. THE COURT: There you go, that’s public. You can use that. And as I said before, I would accept it as a related case, which the plaintiff has the power to designate. I think this current motion is withdrawn. Thank you. [I]n those two articles, as well as the New York Law Journal article, Judge Scheindlin describes herself as a jurist who is skeptical of law enforcement, in contrast to certain of her colleagues, whom she characterizes as inclined to favor the government. Given the heightened and sensitive public scrutiny of these cases, interviews in which the presiding judge draws such distinctions between herself and her colleagues might lead a reasonable observer to question the judge’s impartiality. The Court goes on to say that it does not believe that Judge Scheindlin violated the Judicial Code of Conduct. The Court adds that it has authority to recuse the judge even if neither party requested that relief. And in a separate ruling, the Court further says that Judge Scheindlin has no authority to intervene as a party on appeal for the purposes of retaining her authority on the case. Perhaps your commentary might have reasonably expressed some skepticism about the 2nd Circuit's reasoning and argument given that this blog is about civil rights and the 2nd Circuit trampled on those rights by removing a judge that shouldn't have been removed, on the unstated basis that had nothing to do with what the 2nd Circuit wrote.